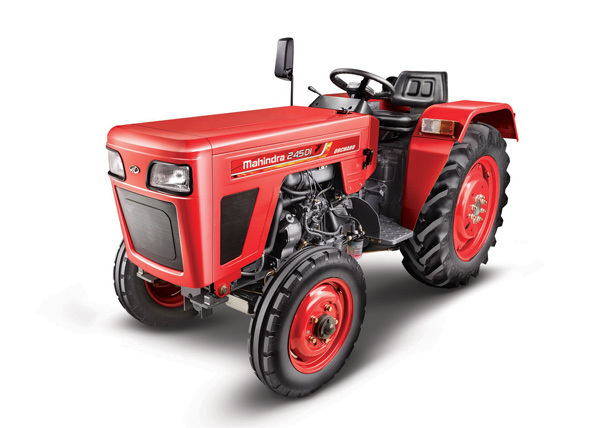 " + innerPageName + "
Mahindra 245 Orchard is a 24HP compact tractor specially designed for inter-culture & orchard operations. With high power & backup torque, it is not only the “Sabse Zordar Sabse Dumdar” tractor in orchard category but also best for agri usage & haulage. Ease of operation due to narrow rear track width & lesser turning radius makes 245 Orchard ideal for operating in between two crop rows as well as in orchards for a variety of inter culture applications. Mahindra 245 Orchard is futuristically designed & styled with special inter-culture features like Down draft silencer, Power Steering, Oil Immersed Brakes & ergonomically designed driver space for comfort. It makes it ideal for crops like soyabean, cotton, Maze, sugarcane and orchards like Grapes, Pomegranates, Mango, Oranges, and many more. It is used by farmers extensively for multiple applications like spraying, rotavation, cultivation, sowing, threshing as well as haulage operations. Enter your details below to request a demo. I agree that by clicking a 'Request a Demo' button below I am explicitly soliciting a call from Mahindra or its partners on my 'Mobile' in order to assist me with my tractor purchase. Type 4 Stroke, Direct injection, Diesel engine. A) Position control:To hold lower links at any desired height. Lifting Capacity 1000 kg at lower link ends. Linkage 3 point linkage Category-I suitable for Category-II type implement pins. Disclaimer : This product information is provided by Mahindra & Mahindra Ltd. India, and is generic in nature. Specifications listed herein above, are based on the latest product information available at the time of release. Some images and product photos used are for illustration purpose only and could show optional attachments available at extra cost. Please contact your local Mahindra dealer for the most up-to-date information on product and the optional features and attachments.